A return to the Championship match didn't seem to be our fate this year, and this would be the first time our senior class wasn't part of that match. We came out strongly in the first set against Amherst, and asserted our dominance early on jumping out to an 8-2 lead, and leading for most of the first set. Amherst made a run, however, and tied it up at 17-17, and took their first lead of the set right after, going up 17-19. We took the lead for the final time at 21-20, and never let it go to finish 25-21. The second set was a nail biter as both teams slugged it out to a 27-29 finish, but not in our favor. 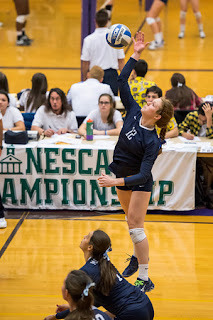 There would be 16 tie scores in this set, with MIDD having the opportunity for set point 4 times, and Amherst only having set point once, but that was all it took for Amherst to steal the set from within our grasp. 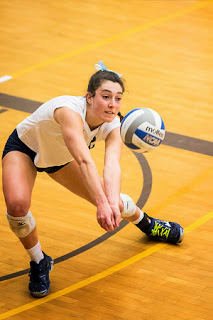 We kept making good plays to go up set point, and often made errors to tie the game back up. Finally, Amherst finished it off with an error by us, followed by a kill from their OH. No problem, that tied the match at 1-1. The third set was another tightly contested set as we took an early lead 8-4, but they fought back to tie it at 12-12, and at 14's. They then got 4 points in a row, interrupted by a blocking error by Amherst trying to stop MJ. After two errors by our hitters, we called a timeout, and scored three straight out of the timeout to close the score to 18-20. 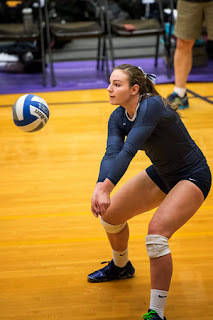 At 20-22, we looked to be making a comeback until the error bug hit us, and we fizzled out the set on two attacking errors, and a receiving error to go down 1-2 in the match. That was a tough blow. After not pulling out the second set, and then not winning the 3rd, despite hitting our best % for the evening at .308, it seemed that we just were a little deflated, and didn't quite have the fight we'd hoped to have to force a 5th set. The only tie score in the final set was at 2-2, but after that we were playing catch up the rest of the way. We managed to get down 9-19, unfortunately, before we made a final push to fight back to 16-20, but couldn't overcome the deficit, and ended the set, match and season on an 18-25 score. Amherst played well. We held their OH1 to 14 kills, but the OH2, who had previously not been a major factor came through in a big way, also scoring 14 kills on half as many sets as their OH1. We seemed to try to ride our seniors into the semi-finals almost single-handedly. 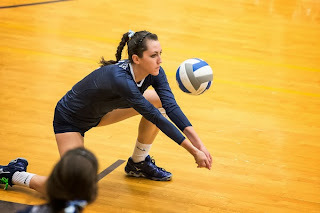 In our previous win over Amherst, our MH's and Olivia combined for 21 kills compared to only 13 this time. We fought valiantly, however, with both MJ and Amy coming in with match-high 24 kills apiece. Hannah had a match-high 55 assists, and Lizzy had a match high 23 digs, but we couldn't quite put enough pieces together to fashion the win. Meg came in and aided our serve receive late in the match, and Olivia and Melanie each had 3 block assists in the effort. We did register 10 more kills than Amherst, but also 15 more errors. They out-blocked us by only 2, although it felt worse than that, and we only had one more receiving error, and one more serving error than they did. I think a key moment came in the second set when we couldn't convert on any of the 4 set point opportunities. At this point in the season, you have to get it done when it counts because you have very limited opportunities. All in all, it was a very close match, and a very competitive one, so we can all feel good about that, well, at least now maybe, after a couple of days to let the dust settle?! We did, however, still manage to eat well on the ride home! It turned out that none of the team, even the seniors had EVER played at Williams before. Funny how our schedule works out sometimes. So, we arrived early enough to actually eat a sit-down dinner in Williamstown before watching some of the early matches that night. Then, Lisa Barrett turned up with another Goodie-Bag including the famous caramelitas and Paradise Cookies, and Katie's parents brought us a bag full of goodies, along with cookies from somewhere else--maybe Lizzy's dad? We do like our food, and we never seem to be in short supply, which is fantastic! I think we may have been eating our sadness out on the way home while we watched Love Actually for about the hundredth time, it seemed. You know, it doesn't matter how long you do this, losing that last match is NEVER easy. It's so sad to see it all end with a particular group, but the good news for those of us returning is that we have a lot to build on for next year! And, we'll miss our seniors very much, but will carry on next year without them, knowing that they'll be watching us from near and far, along with our previous alums who still keep track of us. We should hear about our ED recruits in another few weeks, and that will be exciting to start thinking about also. It should be an eventful off-season with Piper's surgery coming up, Lizzy has a fun excursion planned for J-term, and Crew will be starting for Lizzy and Olivia before too long. I'll start the Leadership Training with the sophomore class over J-term, and we'll meet to go over some of our other power-point presentations we need to cover still with the team. Our strength coach will be starting our new off-season workouts with the team at some point this winter, and we'll hopefully get together to do some other fun out-of-season activities like skiing and snow-shoeing, etc. We'll keep you posted here!